Question: I’m relatively new to fly fishing and want to buy my first “good” fly rod for the upcoming season. There are hundreds of models on the market, so how can I help make sure I get the right one for me? Answer: The most important words in that question are the last two: “for me.” A guy who works at one of the country’s busiest fly shops once told me that 99 percent of his rod-buying customers come through the door with their minds already made up. There are many reasons for this—they want the same rod as their favorite celebrity, a buddy told them what to buy, or they did research on the Internet. But this is a terrible way to prepare yourself to drop a good chunk of change, especially since you might not end up with a rod that works for you. Take a casting lesson. 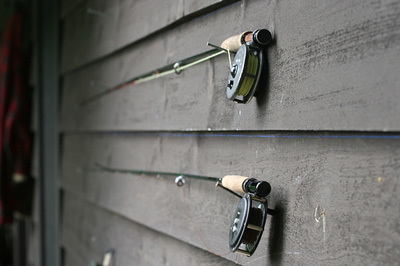 The better caster you are, the better you’ll be able to make different fly rods perform well. Determine how much you’re willing to spend, and focus on the rods in that range, rather than wasting your time drooling over rods you can’t afford. Think about the fishing situations in which you’ll be using the rod, and then consider which kinds of rods and actions are best suited for the task. Ask the advice of the experts in the shop, or bring an experienced fly fisherman with you. Their experience can help you determine the right length, line weight, and action. Cast the rods at your normal fishing distances; don’t just pick the one that you can cast the farthest. For instance, if you are a small-stream brook-trout angler, look for the rod that casts and feels best at 10 to 30 feet. Don’t be wowed by the stick that lets you throw the whole fly line in the parking lot. Once you’ve narrowed the field down to a few candidates, then you can let your more trivial personal preferences—whether you prefer a certain color, fine components, a rod company, or grip style—run wild. Let me repeat that the only way to find the right rod for you is to cast a lot of rods.Fly shops are far and away the best places for anglers to learn about rods and get expert advice. But you have to be willing to listen and learn. And the few extra dollars you’ll spend at the fly shop—instead of getting the rod online—will pay off whenever you need advice in the future.